My name is Vu Phuong Thao. Even though my English proficiency has reached the advanced level, I still decided to look for a short English course to further improve my speaking and writing. Actually, I have visited New Zealand many times and fallen in love with the country’s beauty and the friendliness of its people. I have selected Auckland because it is the biggest city in New Zealand with many international direct flights and has a warmer weather compared to other cities. I did a few Internet searches for English schools in Auckland and got attracted immediately to the Languages International (LI) website because of its professional appearance. Going through its pages, I could actually find all the information that I needed to know such as the courses and levels offered, enrollment conditions, fees, accommodation arrangement. Especially the school location, which is in a beautiful park in the Auckland CBD, immediately got my attention because I loved shopping and sightseeing. Furthermore, after reading all positive reviews of the former students in the school website, I have no more reasons not to go for Languages International. The school enrollment process, which was very quick, was very effective in helping me to get the New Zealand visa. Here I came to charming Auckland to start my exciting journey. Every day, I attended 3 classes from 8:30am to 1:30pm. In all classes, I met students from all over the world. In the school, everyone was a different age, had a different occupation, different English proficiency and different plans for their future but shared one thing in common, which was their friendliness and openness. Besides the class rooms, another common place where the students come to study, read and practice their listening after classes was the Learning Center and the Library. The teachers on duty at the Center were extremely attentive and responsive to the specific needs of each student. Now when I look back at my entire study in LI, the most satisfying result for me is that I had an excellent chance to review English grammar, to understand the use of certain verbs and expressions in depth, to practice listening to the accent of the English native speakers and to dramatically improve my vocabulary. 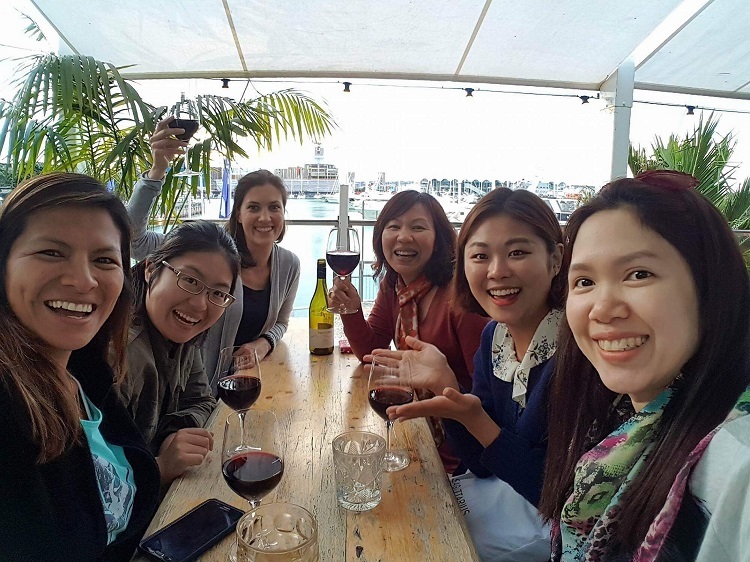 LI not only cares about teaching English, but it also understands the student’s interest in exploring New Zealand culture and history, the current life of New Zealanders as well as the beauty of New Zealand. Hence, it addresses this interest perfectly by organizing the social program twice per week in partnership with a professional tour agent Kiwiana. The programs have a wide range of activities from making lolly cake to taking a rock climbing class, visiting museums in the city and sites of attraction nearby Auckland. Within 5 weeks at the school, I attended the program 3 times. I visited the Piha beach, the Maritime Museum and the Aquarium. In each visit, I not only learnt about the place and the theme but also met new friends, who also joined the program. Talking about accommodation, before I had come to study, I already had an interest in getting to know the way the local families live. Therefore, I registered for a homestay. LI introduced me to my host Ms. Wendy Casey, who is an amazing Kiwi lady. Wendy went to work every day yet managed to cook delicious dinners for us. She carefully explained which bus to take to school, where to buy what, and even took me to the charming Tauranga city, which is a 3-hour drive from Auckland. There was another student, from Thailand, living in the same homestay. After 5 weeks, the three of us have become so close that we felt like we were from the same family. My story about my experience at LI would not be complete without mentioning my new friends. Right after the first week at school, I was lucky enough to join a group of 5 students from Japan, Peru, Thailand, China and South Korea. Every day after class, we organized exciting activities together: trying a new restaurant for lunch, going out for a coffee and chit chat, exploring the famous places in the city such as the Parnell rose garden, Mission Bay, the Takapuna Sunday farmers market, Ponsonby with its famous restaurants and bars, Devonport as a historical place related to Auckland’s establishment back in the 19th century. 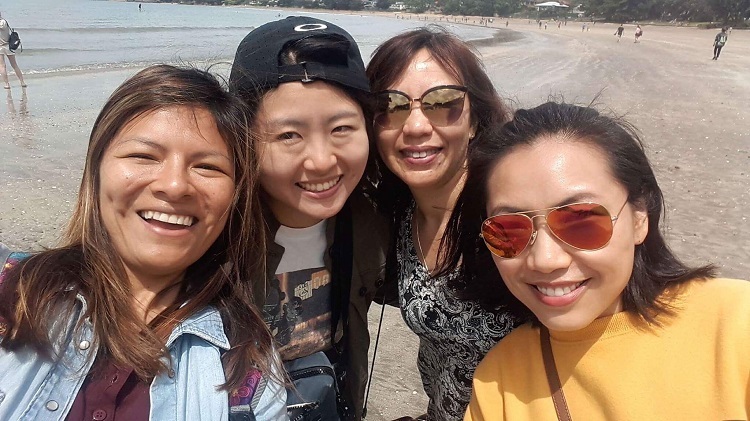 We talked about our jobs and families, our dreams… The funniest part in our conversation was that there were times we had to figure out what other person wanted to say because our levels of English were not the same and the pronunciation was also different. However, this did not upset or separate us at all. In fact, every laugh has brought us even closer to each other. Currently, even though some of us have already finished our study, some are still at LI, we still keep in close, almost daily, touch via Facebook. All good parties have to come to an end. My study in LI is over. I realize that English remains a large ocean, which I should continue exploring. However, what I really gained from LI and treasure the most is the unforgettable memories of my teachers, my host Wendy, the beautiful landscape of New Zealand and of course my amazing friends, who I will always long to meet again.